JBSA-LACKLAND AIR FORCE BASE, TEXAS--Recovering four-legged warriors are getting enhanced rehabilitation therapy thanks to the new Sports Medicine Rehabilitation Facility at the Lt. Col. Daniel E Holland Military Working Dog Hospital on Joint Base San Antonio -- Lackland. Officials cut the ribbon to the new facility, as well as new hospital recovery kennels, during a ceremony at the hospital Thursday morning. 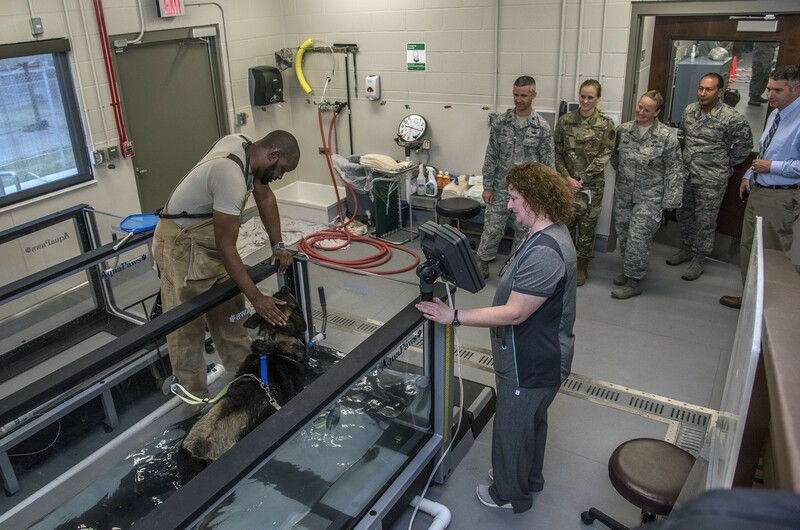 "Members of the Army Veterinary Services take great pride in our ability to deliver world class veterinary care to the (Department of Defense) working dog population," said Brig. Gen. Erik Torring III, U.S. Army Veterinary Corps chief and U.S. Army Medical Command deputy chief of staff for operations, G-3/5/7. 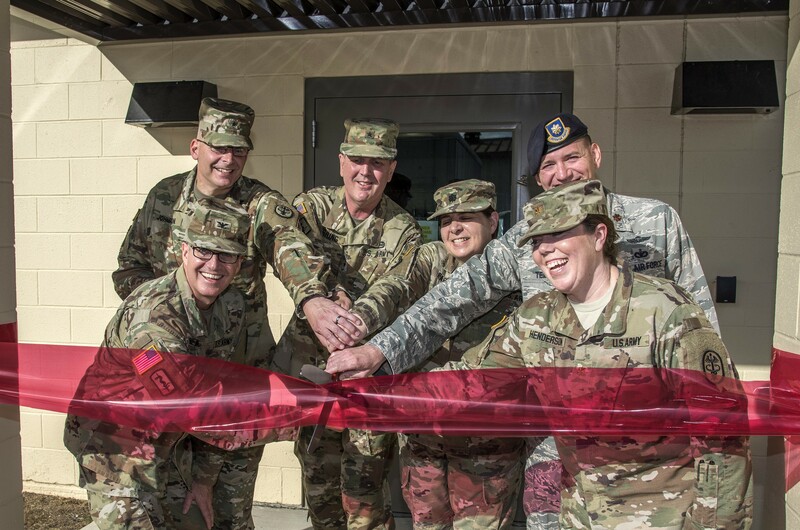 "These renovated and upgraded facilities are another step in re-enforcing our unwavering commitment to their care and the critical force protection capability they provide." The new rehabilitation facility provides flooring and lighting more suited to protect post-operative patients and minimize their stress. The canine patients have a new, quiet room where manual therapy is completed. 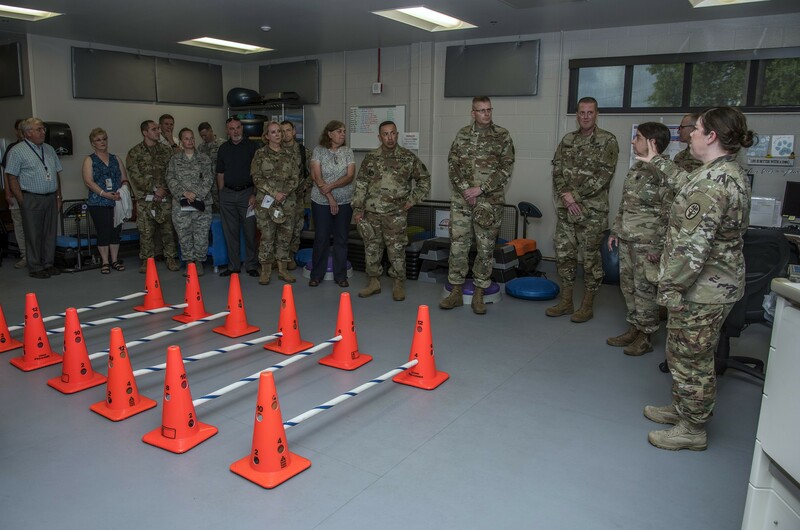 A larger exercise area allows for the placement of equipment in various configurations to tailor exercise programs and challenge levels specific to each patient. The new facility also includes an aquatic therapy room with a jetted pool and two underwater treadmills. The design upgrades to the Holland Military Working Dog Hospital provide improved access to MWD patients directly from the hospital to the expanded kennels. The kennel expansion has an additional 22 runs. These runs allow veterinary staff to have better oversight of hospitalized rehabilitation and surgical patients. "All of these improvements are a significant step in improving care for these working animals and getting them back to duty as quickly as possible," Torring said. "Doing so enhances readiness…and allows these working dogs to get back to what they do every day -- and that is save lives." While the facility and equipment on hand is vital for the treatment and rehabilitation of the animals, Torring shared the most important part of the facility is "the people who tirelessly work every day to make this facility so special. They contribute to readiness every day for the DOD and I'm proud of each one of them for their contributions to Army veterinary services. 80 -- Animals referred for specialty, medical, surgical or rehabilitative care.